A fine jewellery classic. This stunning 7mm, clear, brilliant-cut cubic zirconia solitaire ring is claw-set in a 925 sterling silver setting. Available is sizes small (UK size L), medium (UK size O) and large (UK size Q). 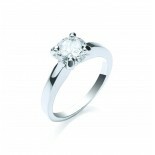 View our ring size conversion guide. Matching pendant (SPCZGN001) and earrings (SPCZE002) available.